The table to the right represents the columns that appear in the online Schedule of Classes. Various symbols may appear in each column denoting specific information. Clicking this icon will direct you to textbooks for the class. class applicable toward Upper or Lower division G.E. class applicable toward Multicultural G.E. class applicable toward both Upper or Lower division & Multicultural G.E. indicates the class has an applicable fee. See the Money Matters section of this Informational Guide for the fee amount. 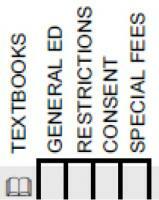 Indicates the class has additional requirements that must be met before a student can enroll. Check the latest catalog available online or in the library. indicates the class requires consent from the Instructor. indicates the class requires consent from the Department Chair. (WP) Writing Proficiency class. Writing proficiency screening test (WPST) required before enrollment in these classes. Online class. See online Schedule of Classes for additional information regarding the online offering. TV 002 - Charter Cable TV Channel 2 available in Ceres, Delhi, Denair, Hilmar, Keyes, Turlock and Modesto zip code 95351. TV 2OR96 - Charter Cable TV Channel 2 available in Ceres, Delhi, Denair, Hilmar, Keyes, Turlock and Modesto zip code 95351 --OR-- Comcast Cable TV Channel 96 in Modesto. TV 096 - Comcast Cable TV Channel 96 in Modesto excluding zip code 95351. *Stockton Room numbers with “A” prefix are in the Acacia Building.